Functional somatic syndrome (FSS) is characterized by the presence of multiple cryptogenic symptoms such as severe fatigue, pain, sleep disturbance, malaise, and cognitive dysfunction [1–3]. FSS includes disorders such as chronic fatigue syndrome (CFS), fibromyalgia syndrome (FMS), and irritable bowel syndrome (IBS). Although these diseases exhibit substantial overlap with regard to symptoms, their etiologies remain largely unclear . Previous research studies have indicated that the pathogenesis of such disorders may involve the disintegration of the nervous, immune, and endocrine systems due to prolonged psychological and physiological stress [5, 6]. Animal models may therefore help to elucidate the molecular and cellular mechanisms underlying the pathogenesis of these disorders. Several recent studies have utilized a chronic or continuous stress-loading (CS) rat model that partially mimics the symptoms associated with CFS and FMS [6–11]. In this model, a rat is placed in a cage with a very low level of water (1.5 cm in depth) for 1–5 days to induce a continuous level of stress (i.e., CS). Using this model, researchers have demonstrated that CS induces gene expression in several organs, as well as dramatic changes in the pituitary gland at the molecular and cellular levels [7–9, 11–13]. Rats exposed to CS exhibit significant activation of melanotrophs in the intermediate lobe and suppression of somatotrophs in the anterior lobe, as evidenced by the active secretion of alpha-melanocyte stimulating hormone (α-MSH) and significant decreases in growth hormone levels in sera [9, 10]. Notably, recent evidence suggests that patients with CFS exhibit higher levels of α-MSH in the blood, and thus, the rat CS model may be useful for further investigations of CFS . Interestingly, alterations in pituitary hormone levels are caused by changes in dopaminergic and growth hormone-releasing hormone (GHRH) neurons in the hypothalamus, suggesting that CS-induced impairments of the endocrine system are due to changes in central nervous system (CNS) neurons. Another characteristic symptom of CFS and FMS is abnormal muscle pain (e.g., hyperalgesia) [1–3]. 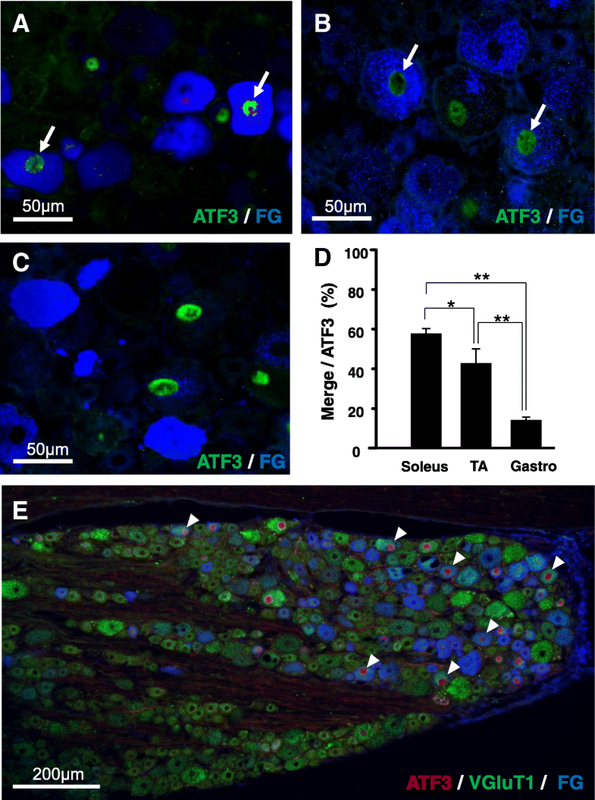 We previously demonstrated that rats under CS exhibited mechanical allodynia at the plantar surface and mechanical hyperalgesia at the anterior tibialis (i.e., muscle pain) . 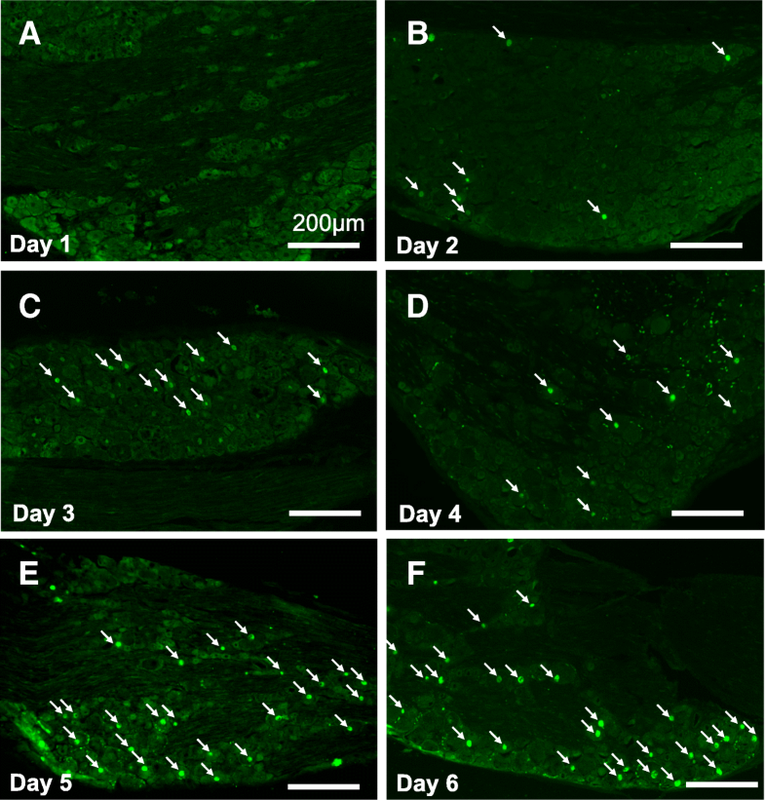 Although no signs of inflammation or injury were observed, the rats exhibited microglial accumulation and activation in the lumbar dorsal horn (L4–6). Minocycline, an inhibitor of microglia activation, significantly attenuated CS-induced mechanical hyperalgesia and allodynia. These results suggest that the pain observed in patients with CFS and FMS involves microglial activation , although it remains unclear why microglial accumulation occurs within a restricted area. In the present study, we investigated neuronal activation in specific areas of the spinal cord and dorsal root ganglia (DRG) in rats exposed to CS. Our results suggested that continuous and specific hyperactivation of proprioceptors triggers microglial activation, thereby inducing prolonged abnormal levels of pain. As described in our previous study , microglial activation and accumulation were observed in the medial region of the dorsal horn after 5 days of CS (Fig. 5a–d). 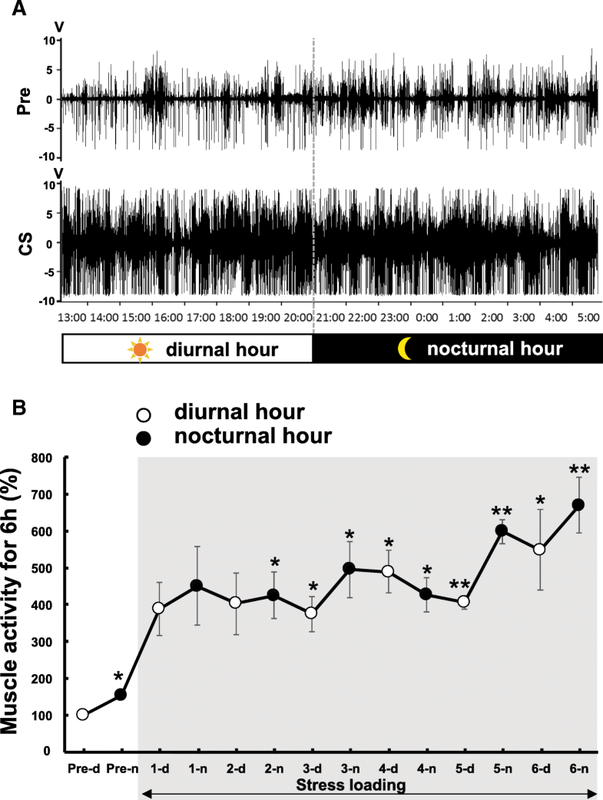 Intriguingly, microglial activation and accumulation were also observed in the dorsal area of the ventral horn when the duration of CS was extended to 6 days (Fig. 5e, f). The accumulated microglia in the dorsal part of the ventral horn exhibited relatively flat cell bodies with short and thick processes, indicative of an activated state (Fig. 6a), and appeared surrounding relatively large neurons (Fig. 6b). Importantly, the activation patterns observed in the dorsal horn and the ventral horn were distinct; microglial adhesion to the neuronal soma was specifically observed in the ventral horn. 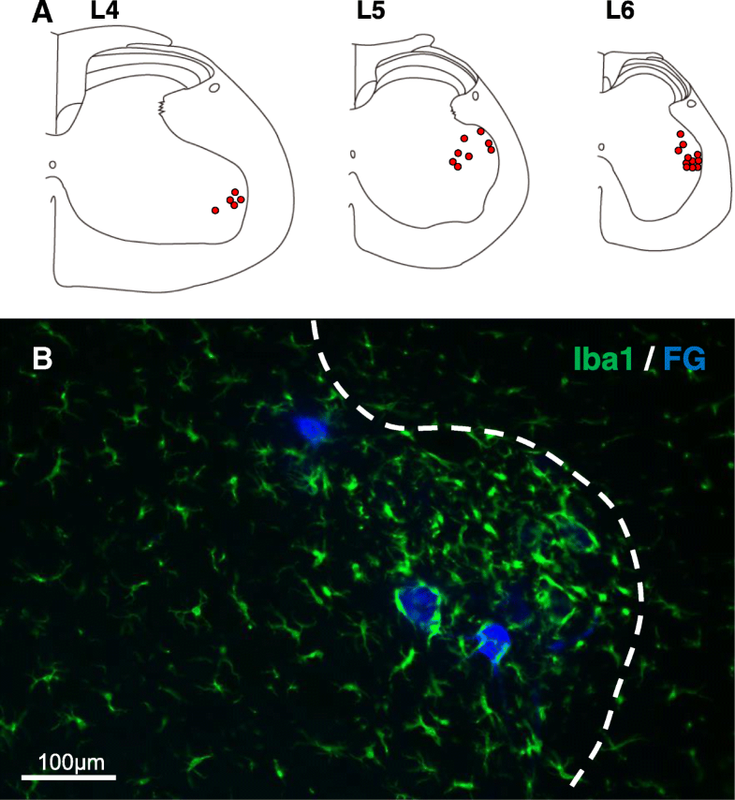 In addition, large ChAT-positive neurons, which were assumed to be motor neurons, were surrounded by Iba1-positive microglia (Fig. 6b). This result was also confirmed using another motor neuron marker, DINE (Fig. 6c) [21–23]. 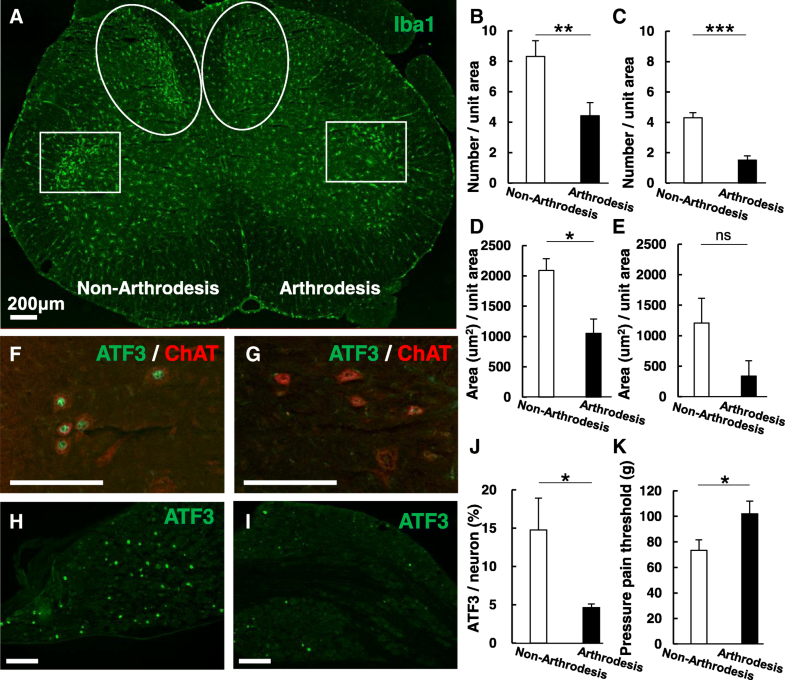 Some ChAT-positive neurons located in this region also expressed ATF3 (Fig. 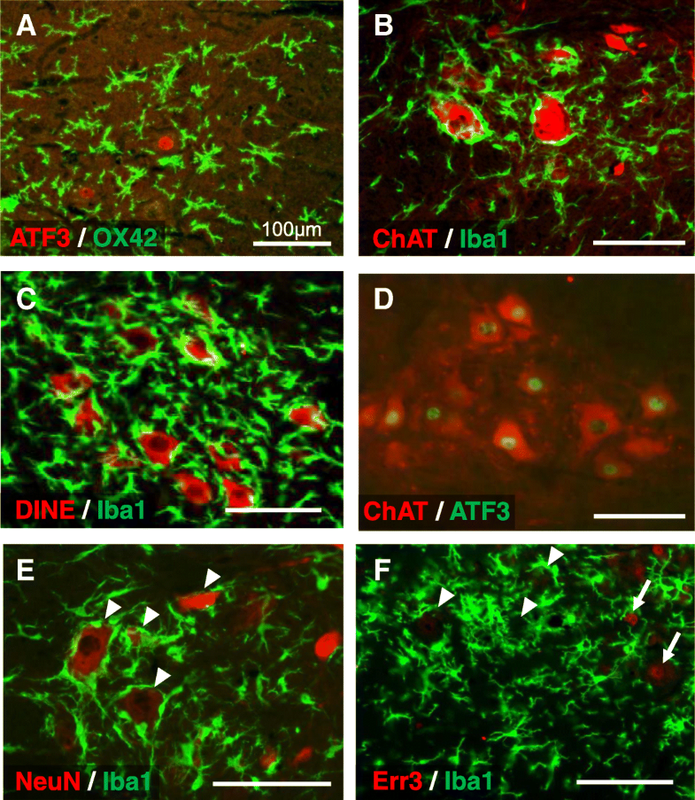 6d), suggesting that a subset of ATF-3 positive motor neurons located in a restricted dorsal region of the ventral horn is surrounded by microglia following the induction of CS. Next, we examined whether these motor neurons were α- or γ-type motor neurons using antibodies against NeuN and Err3, respectively. As seen in Fig. 6e and f, cells surrounded by microglia were NeuN-positive (arrowheads in Fig. 6e) but not Err3-positive (arrows in Fig. 6f), suggesting that microglia surround α-motor neurons within a restricted dorsal region of the ventral horn. The results of the present study demonstrate that the rat models of CFS experience long-lasting allodynia and muscle pain even in the absence of peripheral inflammation and nerve injury and that this pain is likely to be initiated by continuous hyperactivation of proprioceptors in the DRG. Such long-lasting proprioceptor activation would continuously stimulate the reflex arc in the spinal cord, further inducing microglial activation along the arc. Microglial activation would in turn exacerbate and prolong the abnormal pain [24–29], suggesting that proprioceptor-induced microglial activation may underlie pain generation in CFS and FMS.